Background: Enzymes are biomolecules functioning as catalysts accelerating the speed of specific reactions. Increasing global population, lifestyle trends, biofuels and chemical/pharmaceutical applications have positive impacts on global demand for new industrial enzymes. The global market of enzymes has been growing, which is estimated in 2015 to be about 3.7 billion USD with a 10% expansion. Objectives: In this review, we discuss the thermophilic and hyperthermophilic enzymes with respect to their sources, applications, and methods for improvement. Prospective enzymes that have potential industrial applications and industries that need new candidate thermophilic enzymes will also be presented. Results: Research, reports and online contents related to industrial enzymes are reviewed. 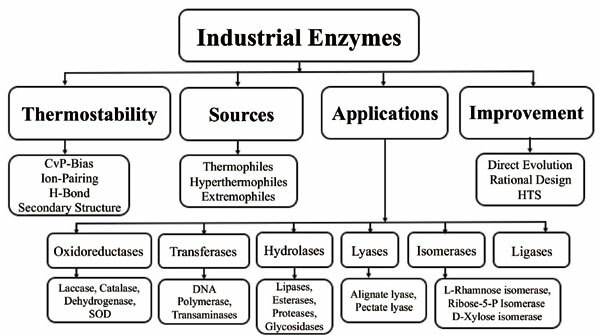 Industrial enzymes have many applications such as detergent, food, animal feed, cosmetics, biofuel, medication, pharmaceuticals, technical use, and tools for research and development. Commercially available microbial enzymes are about 200 out of almost 4,000 enzymes known. The recent increase in the global environmental awareness requires industry with environmentally friendly conditions and as-low-aspossible energy consumption, which shed light on the benefits of using enzymes. Microorganisms are major sources for industrial enzymes, especially thermophilic and hyperthermophilic microbes. Thermostable enzymes have many desirable characteristics such as thermostability, wide range of pH tolerance and resistance to organic solvents, which make them superior for industrial applications. Conclusion: Thermophilic and hyperthermophilic enzymes represent a superior source for industrial applications. More efforts are needed for increasing the implementation of thermophilic and hyperthermophilic enzymes in industries, and screening for new enzymes from different sources and creating new methods for harnessing these enzymes for more industrial applications. Keywords: Industrial enzymes, extremozymes, thermophilic, hyperthermophilic, enzymes, Compound Annual Growth Rate (CAGR), proteases, detergents, biocatalysis, thermostable. Keywords:Industrial enzymes, extremozymes, thermophilic, hyperthermophilic, enzymes, Compound Annual Growth Rate (CAGR), proteases, detergents, biocatalysis, thermostable. Abstract:Background: Enzymes are biomolecules functioning as catalysts accelerating the speed of specific reactions. Increasing global population, lifestyle trends, biofuels and chemical/pharmaceutical applications have positive impacts on global demand for new industrial enzymes. The global market of enzymes has been growing, which is estimated in 2015 to be about 3.7 billion USD with a 10% expansion.